Okay, so here’s a hypothetical… I might have just stumbled upon some fabric and ribbon that I bought about a year ago. It had been destined for an adorable little pleated skirt for the kidlet. Buuuuut that was before I knew the limitations of my sewing skills. Thinking hot glue wouldn’t suffice for such a creation, I abandoned the project and kind of forgot about the fabric. 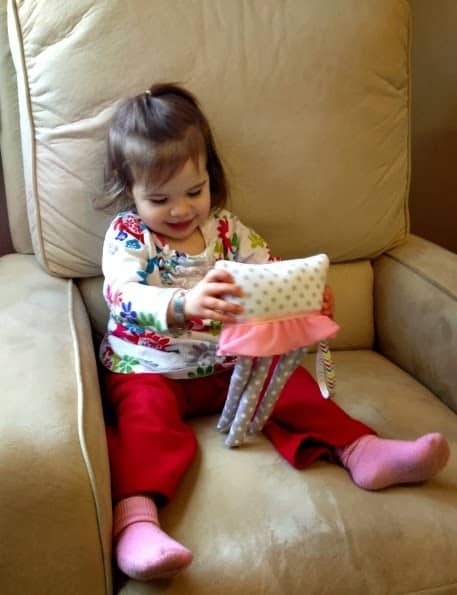 But just look at Elise’s new friend made with that perky polka dot pattern. And, I have enough fabric left over to make that pleated skirt! Or, more realistically, someone else could make it for the kid. Any takers? Click on “Read More” to join the fun! 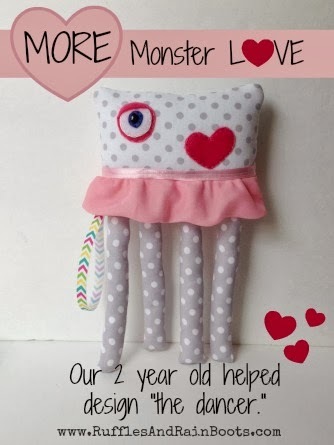 Much like the first monster Elise (26 months) helped to design, this one isn’t perfect because I can’t sew very well. I did forget to sew the eyelashes that were on our drawing – and the arms (oops) – but Elise didn’t seem to care. She wanted a dancing monster with lots of legs – who needs arms? To have some consistency, I used some of the same accents as her first monster, namely the chevron ribbon for hanging and the fuchsia felt for a heart. When she saw the monster after her “I’m going to play in my room instead of nap” time, Elise immediately started making the monster dance. I was too slow with the camera to catch the “Oh, she’s so beautiful, Mommy!” that she exclaimed. It’s amazing how much she’s grown in such a short time. I remember propping her up in that rocking recliner in her room when she was just a little thing so that we could document her growth month by month in her first year. Here she is in that chair when she had just turned 1 month. 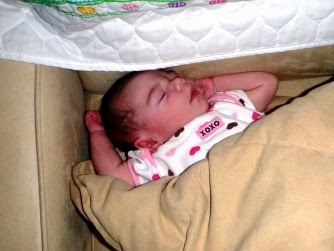 Sadly, it doesn’t show how small she was in that big chair, but it’s remarkable to think back through all the changes. So many more changes to come. This parenting thing is pretty cool. Thanks for stopping by today. Use the comments section to let us know you were here and don’t forget to subscribe so you don’t miss out on all the fun! 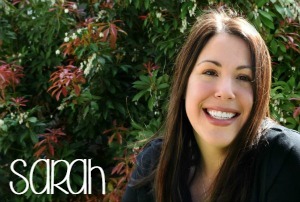 Sarah Nenni-Daher is a participant in the Amazon Services LLC Associates Program, an affiliate advertising program designed to provide a means for sites to earn advertising fees by advertising and linking to amazon.com. Proud member of the International Blogger's Assoc!